Download "The W.K. Kellogg Foundation Fellowship in Health Research"
2 Application Requirements The required application materials include: An up-to-date resume or curriculum vitae. An essay of 500 to 1,000 words discussing why you are applying for a fellowship, your qualifications, your interest in one of the areas of focus, and how the fellowship will support your career plans. Three letters of recommendation one professional, one academic and one other. 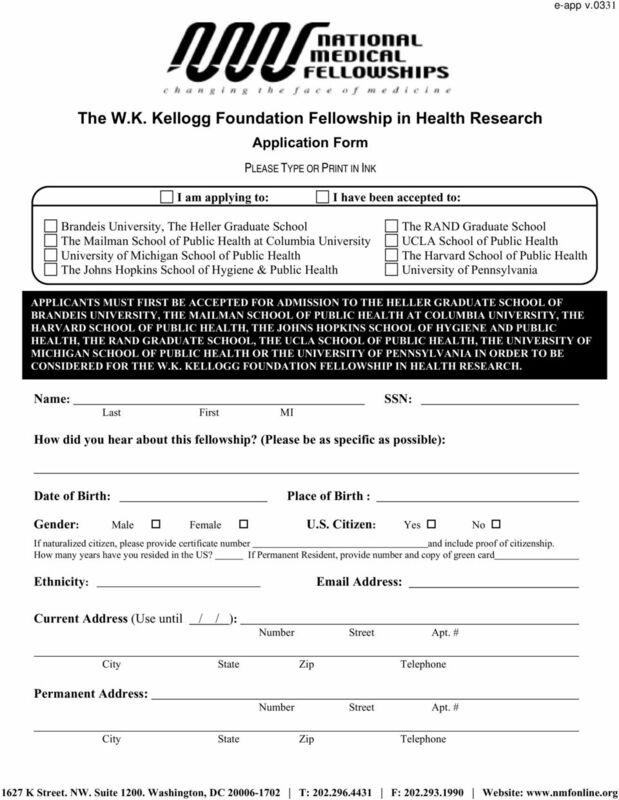 Letters should describe applicant s character, background, analytical capabilities and demonstrated interest in health policy and health policy research. Official transcripts from all undergraduate and graduate schools. Financial Aid Information Release Copies of any published articles, abstracts, etc. THE SELECTION PROCESS The deadline for receipt of applications by National Medical Fellowships, Inc. is June 30, The National Advisory Committee will select Fellows on the basis of academic accomplishments, research potentials, demonstrated interest and ability in health policy research, and commitment to working with underserved populations. Designated Fellows will be announced in summer of Coursework must begin, or continue, at participating institutions the following fall. 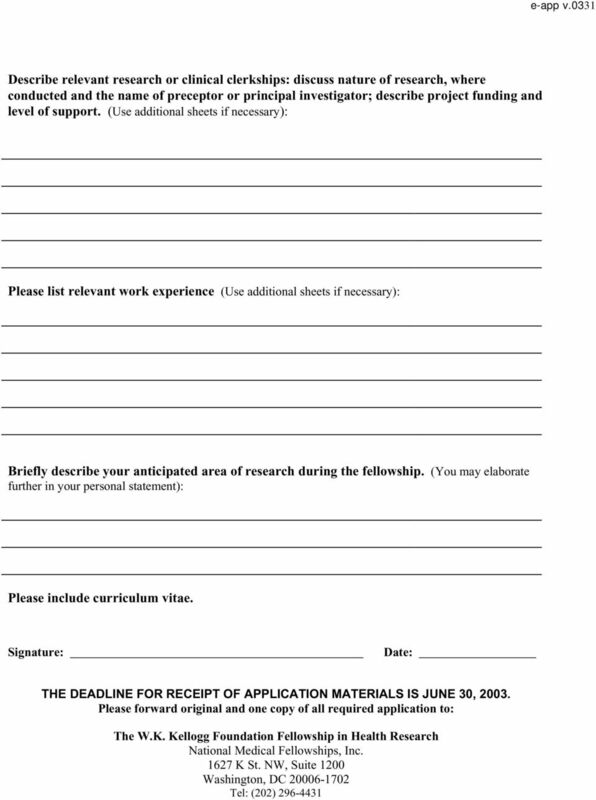 THE ORIGINAL AND ONE COPY OF ALL APPLICATION MATERIALS SHOULD BE FORWARDED BY June 30, 2003 TO: National Medical Fellowships, Inc K St. NW, Suite 1200 Washington, DC Tel: (202) Facsimiles will not be accepted. Please staple but do not bind your applications. 6 Application Checklist Completed Application Financial Aid Information Release Resume or curriculum vitae Personal essay Three letters of recommendation one professional, one academic and one other Official original transcripts Copies of publications, abstracts, etc. 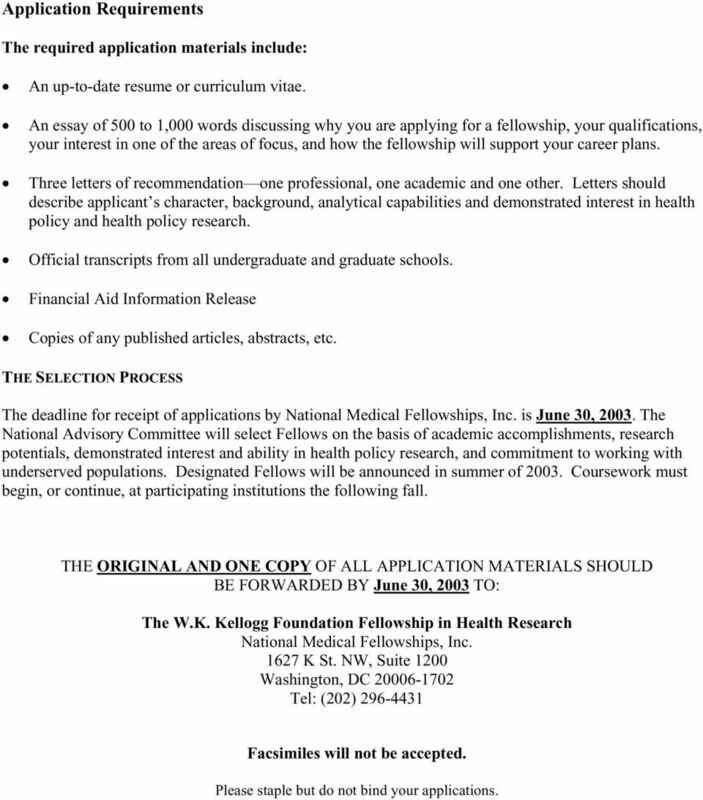 THE ORIGINAL AND ONE COPY OF ALL APPLICATION MATERIALS SHOULD BE FORWARDED BY JUNE 30, 2003: National Medical Fellowships, Inc K St. NW, Suite 1200 Washington, DC Tel: (202) Facsimiles will not be accepted. 7 Personal Statement (PLEASE TYPE) Name: Last First MI SSN: Current Address: (Number, Street, Apt. 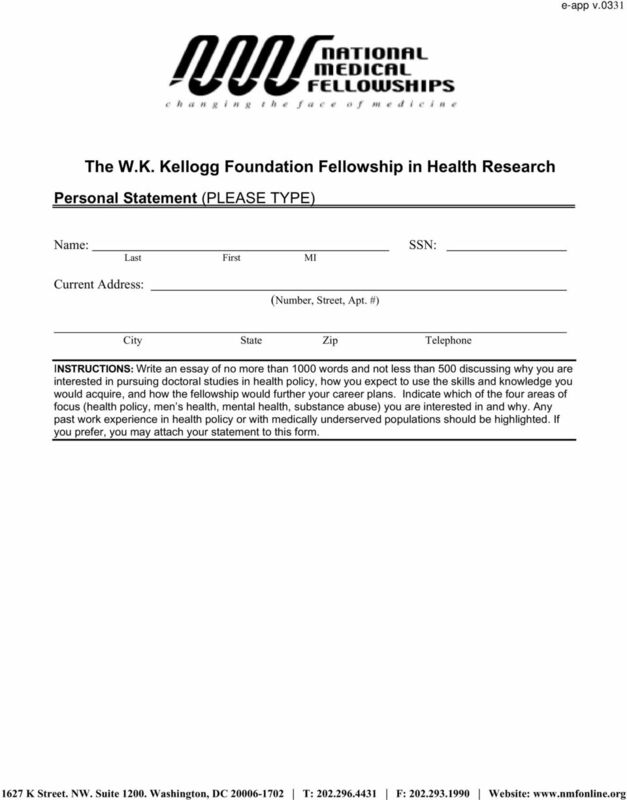 #) City State Zip Telephone INSTRUCTIONS: Write an essay of no more than 1000 words and not less than 500 discussing why you are interested in pursuing doctoral studies in health policy, how you expect to use the skills and knowledge you would acquire, and how the fellowship would further your career plans. Indicate which of the four areas of focus (health policy, men s health, mental health, substance abuse) you are interested in and why. Any past work experience in health policy or with medically underserved populations should be highlighted. If you prefer, you may attach your statement to this form. 8 Financial Aid Information Release INSTRUCTIONS: The size of the fellowship stipend will vary according to individual and school budgets. National Medical Fellowships, Inc. will need to verify your personal budget with your school s financial aid office. Please complete and sign this form and return by the designated deadline date with the required application materials. Name: Last First MI SSN: I authorize the Student Financial Aid Office at (check one) Brandeis University, The Heller Graduate School The Mailman School of Public Health at Columbia University University of Michigan School of Public Health The Johns Hopkins School of Hygiene & Public Health The RAND Graduate School UCLA School of Public Health The Harvard School of Public Health University of Pennsylvania to release pertinent financial aid information National Medical Fellowships, Inc. in support of my application for a W.K. 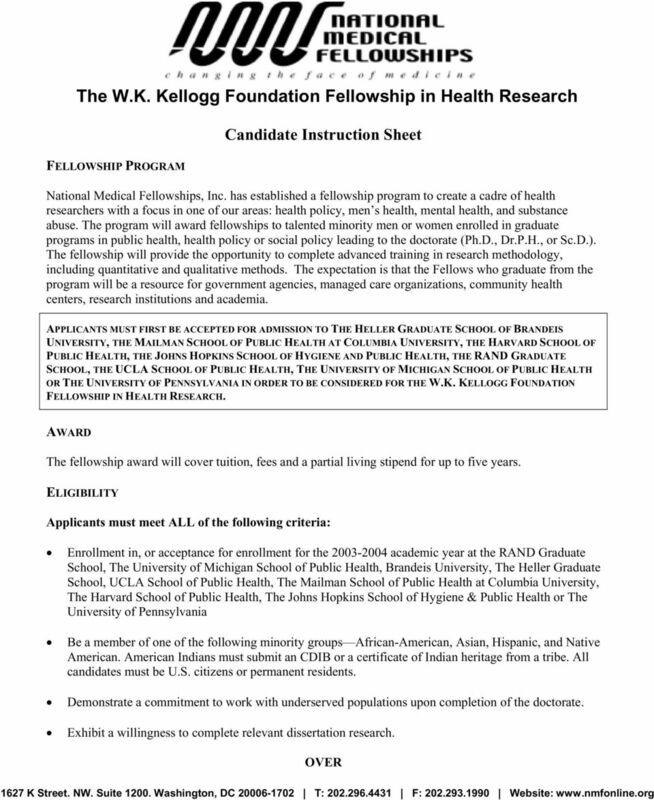 Kellogg Foundation Fellowship in Health Research. 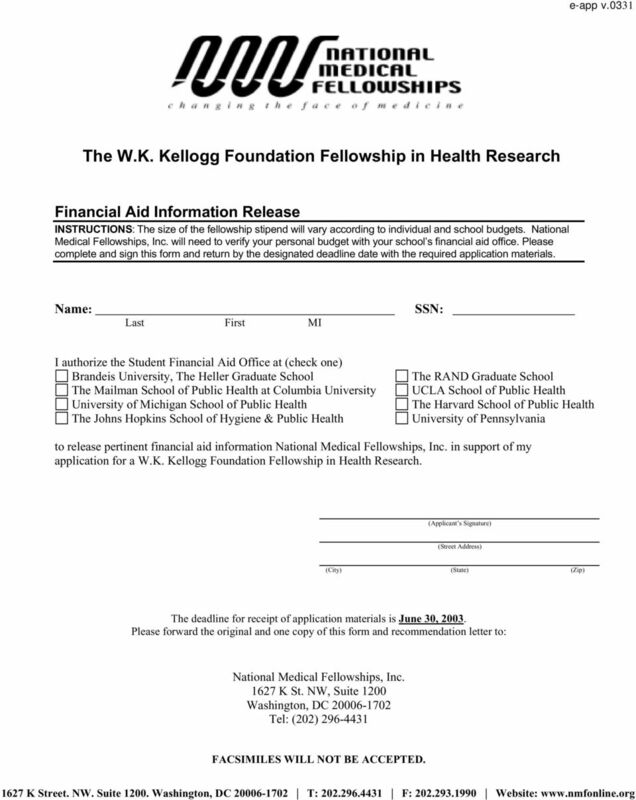 (Applicant s Signature) (Street Address) (City) (State) (Zip) The deadline for receipt of application materials is June 30, Please forward the original and one copy of this form and recommendation letter to: National Medical Fellowships, Inc K St. NW, Suite 1200 Washington, DC Tel: (202) FACSIMILES WILL NOT BE ACCEPTED. 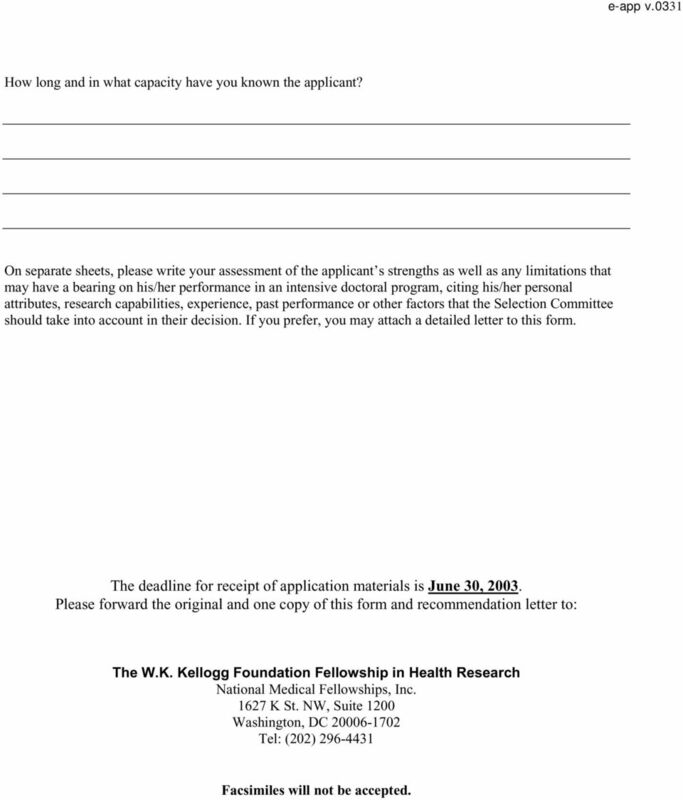 10 How long and in what capacity have you known the applicant? 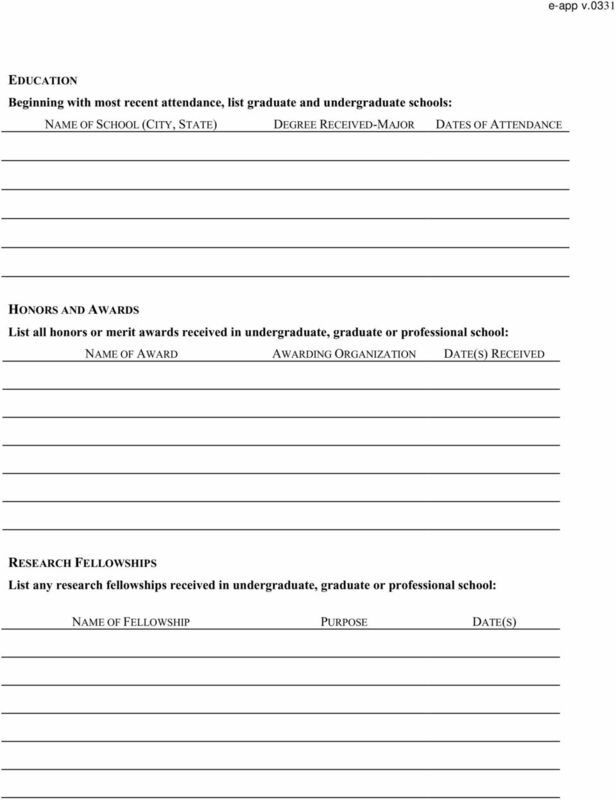 On separate sheets, please write your assessment of the applicant s strengths as well as any limitations that may have a bearing on his/her performance in an intensive doctoral program, citing his/her personal attributes, research capabilities, experience, past performance or other factors that the Selection Committee should take into account in their decision. If you prefer, you may attach a detailed letter to this form. 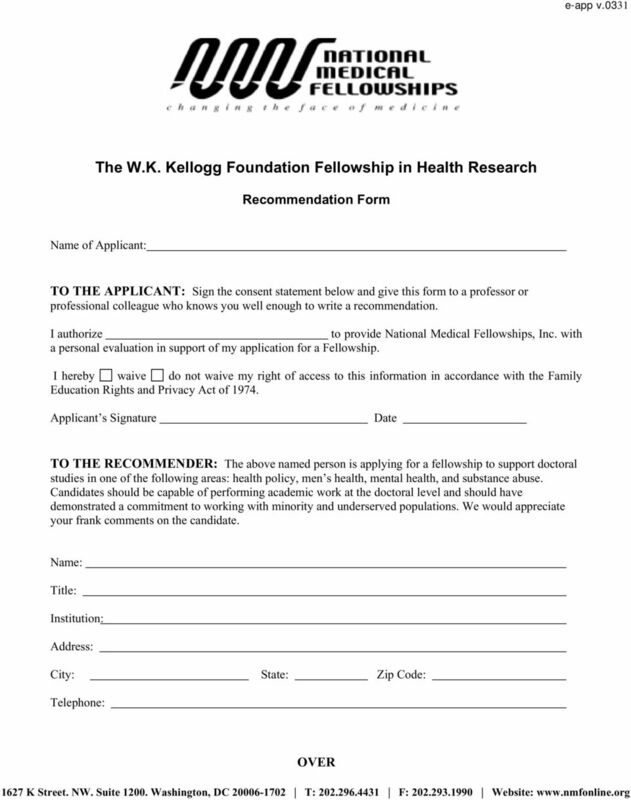 The deadline for receipt of application materials is June 30, Please forward the original and one copy of this form and recommendation letter to: National Medical Fellowships, Inc K St. NW, Suite 1200 Washington, DC Tel: (202) Facsimiles will not be accepted. Want to do EXCITING SCIENCE? GET A PhD. Want a PhD? First earn an MS at CAL STATE LA. Mildred Colodny Diversity Scholarship for Graduate Study in Historic Preservation Administered by the National Trust for Historic Preservation Thank you for your interest in the Mildred Colodny Scholarship! Seattle Pacific University R.N. to B.S. Application. Engaging the culture, changing the world. THE 2016 RISE PROGRAMS ONLINE GUIDLINES James A. Ferguson Emerging Infectious Diseases Fellowship Program Thank you for your interest in the James A. Ferguson Emerging Infectious Diseases Fellowship Program. EXCEPTIONALNURSE.COM College Scholarship Awards ExceptionalNurse.com awards a scholarship of $250.00 to a qualified student with a disability to continue their education in a nursing education program.